While visiting France, Doug's cousin Arsene took us to his daughter’s school end-of-the-year program -- a hantess, to Armenians. Arsene’s daughter, Marie-Luz, attended an Armenian day school outside Paris. We’d been to many a hantess before, but never one like this. It started around 11 a.m. and didn’t wind down until about 10 p.m. In June, each teacher and their students performed skits, recitations, dance routines, songs - you name it. Generations of families set up camp for the day, bringing board games, such as tavloo, extra tables and chairs, and a recipe to serve hundreds. Arsene was in charge of the Hummus. Doug and I figured he got off easy with this recipe, even though he’d have to make a huge amount -- just open a bunch of cans of chickpeas, and throw the rest of the ingredients into a blender, small batches at a time. Voila! We were quite surprised when Arsene cleared the car out of his garage, set up a kettle as large as a tympani, and hooked up heating elements, the likes of which we’d never seen before. Doug & I looked at each other, thinking silently yet simultaneously, 3 DAYS??? Is he serious? Arsene was quite serious. He had to pick through the chickpeas for any stones or unsuitable beans, soak, strain, rinse, and cook them before he could even make the recipe. Then he had to make tons of hummus, and refrigerate it for the flavors to blend, so it would be perfect come Hantess-time. And it definitely was perfect, a clear hit with the large and hungry crowd. 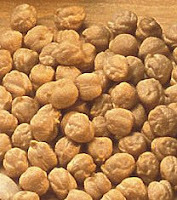 Chickpeas are low in fat, and high in both fiber and protein. They make a nutritious and satisfying addition to soups and salads. Armenians use chickpeas in many ways, but none of our favorites require anything like three days or even three hours to prepare. In fact, we're both particularly fond of roasted chickpeas -- and lazy enough to buy them already roasted. (You can find them in Italian groceries as well as Middle Eastern stores.) They're a healthy and filling snack that you can enjoy without guilt. Add fresh chopped garlic for a bit more bite! Im a 46 yr old Armenian-American from New Jersey, currently teaching English in South Korea. I was born in the US, my grandparents were from Bursa and Sivas. I just made your chickpea salad, threw in a few sliced cherry tomatoes too. MY HEAD EXPLODED WITH THE JOY OF GOD AND MY NECK WAS TINGLING WITH GOODNESS AND PLEASURE AS I ATE AND ATE AND ATE. THAT IS BRAIN FOOD. THAT IS SPIRIT FOOD. THANKS TO GOD, AND THANKS TO YOU FOR POSTING THAT RECIPE. My wife and I (she is from Guyana, South America but her grandparents were from India) are so sick of Korean food and your website just came to my attention a few days back. Keep up the great work. Armenian chickpea salad! OH MY GOD. I'm full right now, but the thought of it has me salivating even though I'm stuffed. :) Thank you brother. You have warmed our hearts with your enthusiastic comment! We're so glad you've found us, and hope that the other recipes will satisfy you as well. By the way, Doug and I are also from NJ. Perhaps we know you and your family. If you click on the highlighted word "hummus" in the story, it will lead to the post with the hummus recipe. Or, click on the word "hummus" in the recipe list to the right. SHAT SHNORHAKALEM!!!!!!!!! THANK YOU FOR YOUR LOVE TO KEEP THE ARMENIAN FOOD LINE A LIVE!!!!!!!!!!!!! THANK YOU,MERCY SIRUM EM DZEZ. Hi have you ever made a socca from chickpea flour? I understand its amazing, gluten free too!